Learn to say no to new projects. Have a higher bar for projects with big exit costs. Book chapters and reviews are a waste of time. Get your dissertation papers or book out. This list is not comprehensive. This is not a weakness, but rather an opportunity to add to the list. The above list solely focuses on research and publication for assistant professors at research intensive universities. I have a few things to add to the list. My tips, however, narrowly focus on time management. Most aren’t just for academics. There are two basic rules for time management: Do less or do it faster. There are no real tricks. I recommend learning how to say no to superfluous department, college and university service that will not add value to a tenure case and to be careful with collaborations. 80% of success is just showing up. Academics of both genders with kids married to working non-academics tend to be the “flexible” ones, who attend to children’s doctors appointments, sick days, and days off of school. It can add up unless a fair plan is in place. Be careful with how you work on the weekends and evening. This seemingly contradicts #2, but it really takes a different angle. It’s important to work “enough” but to also put in quality time. Parkinson’s Law: Work expands to fill the time available for completion, so set deadlines and give tasks less time. Corollary: Never be so busy that you are not a good colleague—it matters for tenure (and for life). 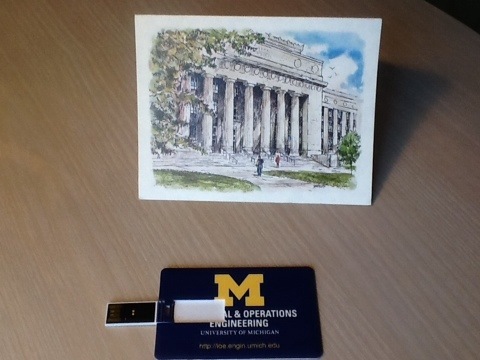 On Friday I gave a seminar at the University of Michigan’s Industrial and Operations Engineering Department. 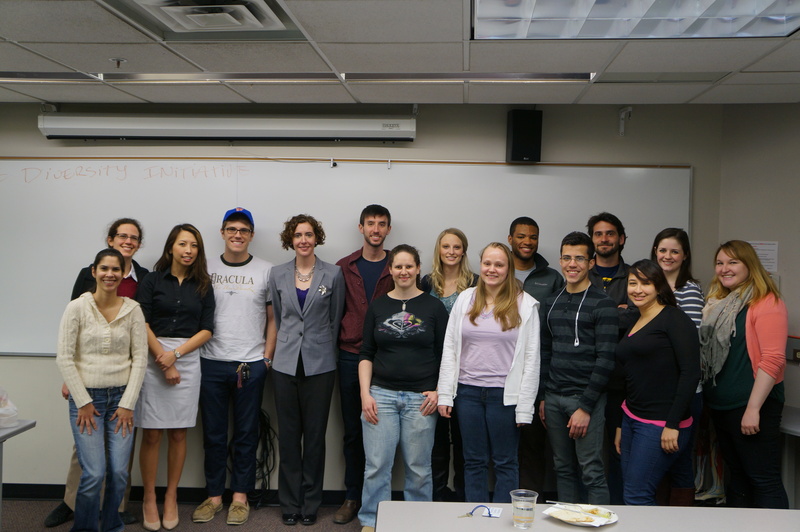 I was invited by the INFORMS student chapter and the Michigan IOE Diversity Initiative headed by Mariel Lavieri. I owe a special thank you to the INFORMS Speakers Program that subsidized the cost of my trip. 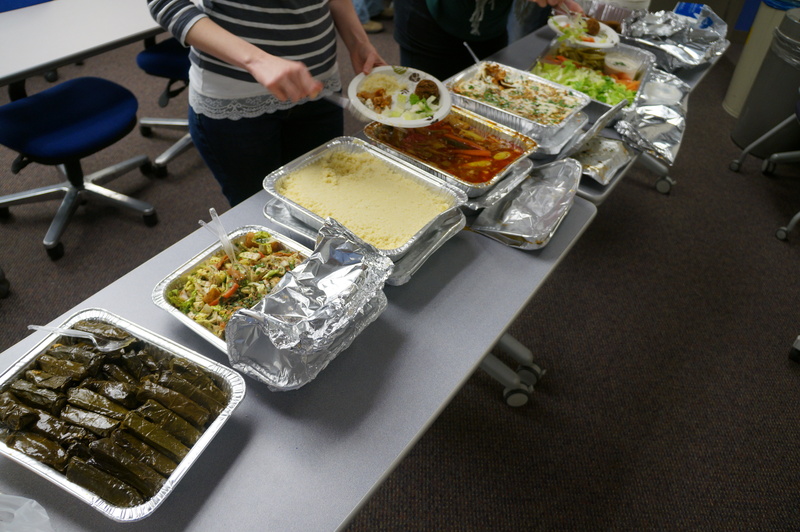 Women, minority, and international students attended the lunch. I was overjoyed to speak to such a large, diverse group including some students not from under-represented groups (white men). As I’ve written about before, you don’t need to be from an underrepresented group to want everyone to feel welcome at the table. Some of the best advocates of researchers from underrepresented groups that I know happen to be white men. I was delighted that all attended and asked great questions and shared a variety of experiences. Questions ranged from raising three children to biases to biases that I’ve internalized to INFORMS WORMS initiatives. I tried to maintain a good balance of positive things with things that could use some improvement. The students were surprised to hear that I only had one women engineering professor in college and had been the only women in some of courses I took in graduate school. I’m glad that some of these things have changed! I especially liked hearing the students talk about their experiences and impressions. I was impressed with how many students attended and participated in the program. Kudos to Mariel Lavieri, who has done a fantastic job with the diversity initiative and encouraging students to attend my talk. After the seminar, the students and faculty gathered in a lounge to enjoy snacks and each other’s company. 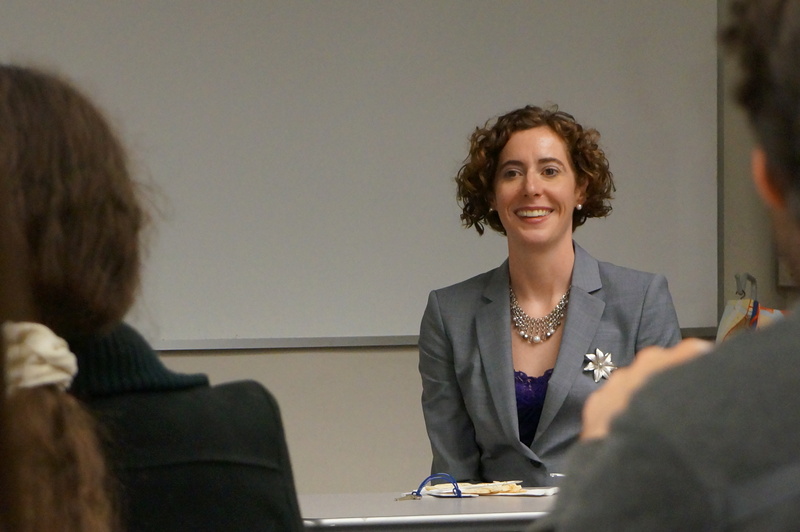 Enjoyed hearing @lauramclay talk today about locating ambulances and being a woman in #OperationsResearch. The thank you note and USB stick from the diversity initiative. 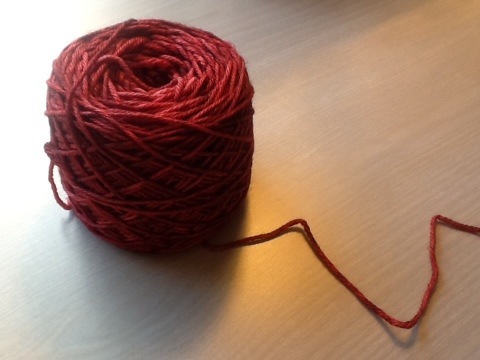 A yarn gift from IOE student and fellow knitter Zohar Strinka. Zohar is also one of the WORMS student liaisons this year. The Anita Borg Institute hosts the Grace Hopper Celebration of Women in Computing conference (see: http://gracehopper.org/). The conference is for women in computing (computer science, IT, etc.). I was on a panel on research and opportunities in security at the 2012 conference. It was a terrific experience. I talked to a large audience full of women (a first for me). I also had a nice lunch with other academics, and met several incredibly supportive male colleagues. The best part of all was attending the career fair. I was completely overwhelmed with how every major software and internet company was there courting the women. I should have scanned in my program from the conference–it was full of ads from these companies specifically tailored to multi-cultural women (the ads weren’t pink and frilly, they were geeky and great!) I have never felt that women were so welcome and wanted in computing as I did that day. I will never forget it. Back to Grace Hopper. She was once on David Letterman! Here is a 10 minute segment from the show (which I think aired back in the 1980s). Grace Hopper is the google doodle today. Grace Hopper will always have a special place in my heart. My cat is named Hopper, and not because of her jumping ability. Letterman: "How did you know so much about computers then?" Grace Hopper: "I didn't. It was the first one." I taught myself how to program on my graphing calculator in high school. Good times. One of the podcasts I regularly listen to (“Stuff Mom Never Told you“) recently has a series of four podcasts on women in STEM (one each for the S, T, E, and M). The engineering and math podcasts were the most interesting. Both podcasts covered many topics, so I’ll just highlight a couple of the topics discussed here. The math podcast [Link] covered the history of women in math and focused on gender differences in math achievement (and sometimes, the lack thereof). The engineering podcast [Link] covered pipeline issues in engineering (recruiting and retaining women). They discussed the success of industrial engineering in attracting women. This podcast will be of particular interest to readers of this blog. High school students (both girls and boys) are often unaware of what engineering is, and as a result, students who are good at math choose majors like math and physics instead of engineering. Increasingly, medicine and forensic science are attractive career options to high school students thanks to television programming. This podcast will resonate with those of us in operations research, which is even less known as a field than engineering (Many know that engineering exists, few know what engineers do. Fewer know that operations research exists(!) ). It’s been one of those weeks when several articles about women in engineering found their way to me. I am very positive about my experiences being an industrial engineer. 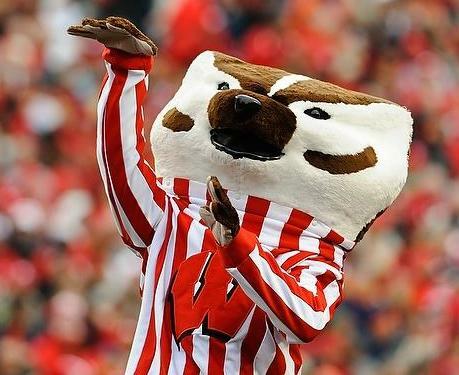 However, I was once an insecure undergraduate who didn’t quite feel like I fit in. These articles struck a chord with me for several reasons. Lara Schubert wrote two nice articles in Structure. The first discusses the invisible gendered culture of engineering, one that I can sadly relate to. I remember being an undergraduate and wondering how I could authentically be both a woman and an engineer. I feel no such conflict now, but I’m older and wiser. Plus, IE and OR/MS have a higher proportion of women than many other fields of engineering so I don’t feel like I stick out quite so much. The second article discusses the consequences of said gendered culture of engineering. Both are a must read, especially for men who mentor or manage women engineers. 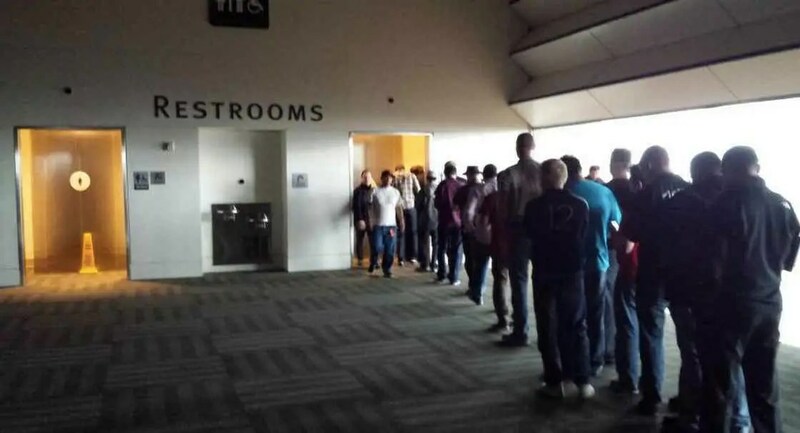 David Smith from OR in Devon blogged about optimizing the men’s bathroom queues. It is a nice article, but of course, it would be great if there were more women involved in computing. This picture made me sad. Mother Jones reports the gender and race demographics of California startups that received crucial seed funding: 89% of the funded startups were founded by all men. Why Women Avoid STEM Careers from the Huffington post. The article links to the Youtube Video (below) produced by McMaster University. On a related note, I put together a talk for students about women in engineering for my seminar at Texas A&M last year, which was in part sponsored by the NSF ADVANCE award at A&M. I commend Halit Uster in particular for organizing an entire seminar series in industrial engineering around women. 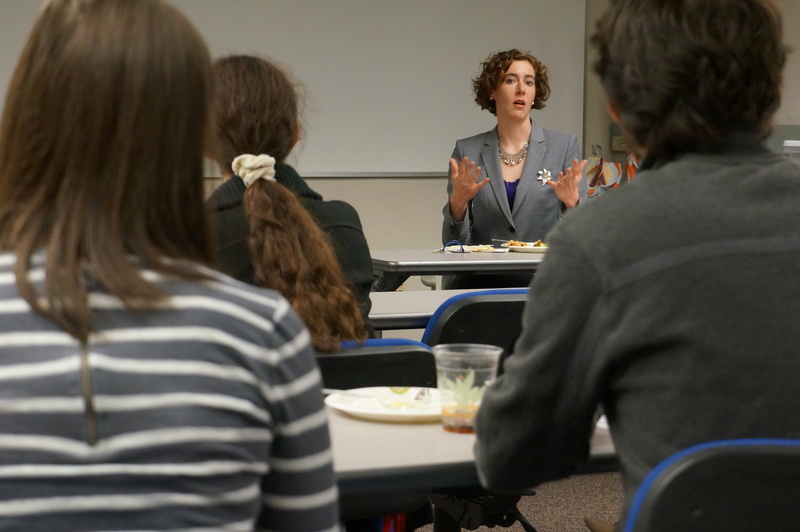 I gave a regular seminar and a talk to graduate students (both men and women). It was a nice experience to put together a few slides about women in engineering and STEM fields. There are a lot of positives (a lot!) but as part of my preparation, I found out that only ~10% of people who identify themselves as engineers are women. Women have been receiving > 20% of engineering BS degrees for a long time now, which means that women are not staying in engineering. In fact, research shows that women leave engineering at a higher rate than other STEM fields (see the recommended reading below). This trend is troubling, and it’s a big reason why I often blog about women in engineering. are there more women in OR? do women write a disproportionate number of operations research papers? Although the percentage of female authors is still less than women’s overall representation within the full-time faculty ranks, the researchers found that the proportion has increased as more women have entered the professoriate. They also show that women cluster into certain subfields and are somewhat underrepresented in the prestigious position of first author. In the biological ­sciences, women are even more underrepresented as last author. The last name on a scientific article is typically that of the senior scholar, who is not necessarily responsible for doing most of the research or writing but who directs the lab where the experiment was based. The study authors note that women are publishing more, but many of these papers are about subject areas that will be discounted because they are about “women’s issues.” For example, women account for 13.7% of authors on economics papers but are overrepresented on papers on economic “household decision-making,” where they account for 30% of all authors. Gains have not been mirrored in the last-author position, which is of particular importance in the biological sciences… “The gap between women as first authors and women as last authors is actually growing, which suggests that women in scientific fields are allowed to have ideas and do most of the work on a paper, but do not yet have the big grants and labs full of students and postdocs that would establish them in the prestigious last-author position,” says Ms. Jacquet. An interactive tool [Link] shows the fraction of journal pubs written by women in different fields. You can select the years and the type of author: any author, first author, or last author. 11.8% of OR papers, 1991 – 2010. The authors of the study note that it’s not stationary even within these timeframes: 2010 was much better for women than 1991. The takeaway from this is that it highlights the importance of mentoring for women. The average women may need help to teach them how to negotiate authorship and publish papers that will not be discounted. To be sure, men need role models, too, and plenty of women have figured out how to master the publishing process. I know that men read this blog, and I sincerely hope that they don’t tune out when professional women’s issues are discussed. Here’s my point: when mentoring programs are in place basically to give women a leg up, everyone will have access to mentors and will thus benefit. I know many men who could use more publishing advice and advice for dealing with “impostor syndrome” (women aren’t the only ones who feel like impostors). In short, scientific literature and blog posts about women’s issues in academia could benefit more than just the women… but only if everyone is willing to come to the table and talk about them. Please leave your two cents in a comment.